Superb, 7 bedroom, traditional perigord style property, offering exceptionally well maintained characterful accommodation over three floors. The ground floor has a large L shaped lounge/dining room, with wood burner, feature stone walling, wonderful oak beams and wonderful arched windows and a French door on 3 aspects, making it a very light and airy room. The modern fully fitted kitchen has tiled flooring and oak beams. There is also an entrance hall, cloakroom, 2 large airy bedrooms and a large shower room. The lower ground floor consists of 2 bedrooms, with a bathroom, kitchen/diner/TV lounge, with French doors leading out to the back patio and swimming pool area (This can be used as a self contained apartment). Also on this floor is a spacious utility room, the boiler room, a table tennis room, seperate w/c and 2 very large garages. The upper floor has the master bedroom, with en-suite, 2 further double rooms and a large bathroom, all these rooms have beams and in the master there is some feature stone walling. All bedrooms are spacious. There is oil central heating throughout. The house is exceptionally well furnished, with the opportunity to purchase any items, by private agreement. 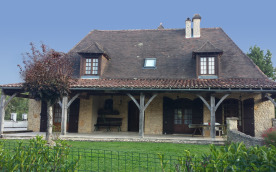 There is excellent potential to run this as a gite or B&B. The current owners successfully rent the house out during the summer holidays. The plot extends to 1.35 acres, with a 10x5m heated swimming pool, an orchard with figs, peaches, apples, mirabelles & cobnuts, grassed areas, 3 patios and a lake. Chanteloube is in the perfect position to take advantage of all the Dordogne has to offer. It's 30 minutes from Bergerac airport and 20 minutes to the wonderful city of Perigueux, with it's magnificent Cathedral, historical sites, wonderful cobbled streets, colourful markets and plenty of places to eat and drink, to suit all budgets. Also within 1 hour of the house, is Sarlat, St Emillion, Le Bugue, Lascaux, Domme, Beynac and La Roque Gageac to name but a few.